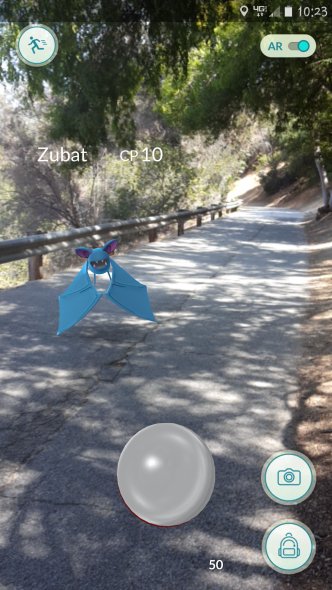 Walking down to the Lower Arroyo, failed to catch Zubat. Full disclosure: When I was a kid, I was more of a Digimon fan. But there was no escaping Pokémon. Simply by having friends, I absorbed all sorts of knowledge about these weird, adorable monsters.I liked them a lot. I picked up some trading cards (haha, remember those?). And then they became a fond memory. I haven’t paid any real attention to Pokémon in years, even though I knew they were still around. But now they’re back in my life, and they are literally everywhere because of Pokémon GO. Now, I’m not much for games. I passed on the Angry Birds craze, I rejected Words with Friends and Farmville, I can’t say I cared much about Candy Crush. But Pokémon GO is different because it’s not just an app game, it’s an augmented reality app game — look at me with the fancy tech talk — that you can only play by actually moving around. And as a person who’s always down for another reason to walk, I had to check it out. So I did. And oh no. It’s good. The premise of the game is simple. Open the app, then start walking in the real world to find virtual Pokémon to catch, train and battle. Standard warnings apply. Please, please, please do as the game says and always pay attention to your surroundings. Don’t get so caught up in finding the next Pokéstop that you walk off a curb, into other people or traffic. Definitely do not play while driving. It’s not worth life or limb to catch that Charizard. That said, I think it’s totally possible to enjoy this game safely. I left early to get to Del Mar Station this morning so I could walk around and see if there were any Pokémon to catch. (There was, but I failed in catching it before my train arrived.) While I was riding the Gold Line in to work, I managed to catch a Pidgey and a Sandshrew. I also found out that quite a few Metro Rail stations double as gyms — which means you could train your Pokémon while waiting for your ride. And one of my favorite aspects of the game is that Pokéstops are usually local landmarks, so I ended up learning a little bit about random public art and buildings I had seen but never paid attention to before. So this temple has a name! Also, speaking of landmarks, did you know that Santa Monica Pier is rife with water-type Pokémon? Walk to the end of the Pier. Check it out. Get there using the Expo Line Downtown Santa Monica Station and maybe catch a few more Pokémon on your way to the Pier. According to LAist, Union Station is another hot spot. I’m about to go out and see if it’s true. Wanna hatch an egg? Walk, walk walk. It’s only been a week since the game was released, and it’s pretty exciting to see the new ways it’s connecting people to each other, and to communities. A random person overheard my friend and I talking about Pokémon GO and taught us how to throw a curve ball. 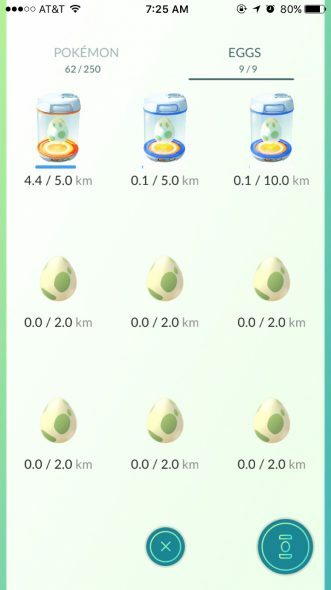 Another friend of mine who hates exercise has now started walking to look Pokémon and to hatch her eggs (because apparently these eggs will only hatch after you walk a certain distance — and you have to walk, you can’t drive it, she tried). I’m sure Pokémon hunting parties will be organized, and this makes me happy because it’s another way to get people to walk and explore neighborhoods they might otherwise never visit. So…are you playing Pokémon GO? What team are you on? And of relevant interest to me, will this game change your commute? Would you be willing to try walking instead and taking transit if it makes it easier for you to catch them all? We’re also working on a map to make it easier to navigate the Pokémon world and search for the wee elusive beasts via transit, and we’ll need your help to populate it. So stay tuned. In the meantime, we’d love to share your tips and adventure stories @PokemonGOMetro. I hope they remembered to TAP! I took my boys to Mariachi Plaza with the hopes of catching the super rare Mariachichu. We were not successful, so I have to ask, do you have any tips or suggestions on how to capture Mariachichu? I don’t play myself so I’m assuming my boys tried everything possible. I’m not sure if Mariachichu is real or not…so far no one has been able to confirm, and I haven’t had a chance to go out to verify myself. It may be that someone photoshopped it, in which case I will update with that information. However, there are definitely rare Pokémon in Santa Monica near the Pier! Hopefully that helps, and I’m glad to see you all enjoying the game safely! Thanks for the update. My oldest was reluctant to make the trip to Mariachi Plaza for the same reason but didn’t want to say anything to deflate my youngest’s enthusiasm. We are planning to make the trip to Santa Monica Pier this weekend.